Women will be allowed to drive for the first time next summer in Saudi Arabia, the ultra-conservative kingdom announced Tuesday, marking a significant expansion of women's rights in the only country that barred them from getting behind the wheel. While women in other Muslim countries drove freely, the kingdom's blanket ban attracted negative publicity for years. Neither Islamic law nor Saudi traffic law explicitly prohibited women from driving, but they were not issued licences and were detained if they attempted to drive. Prince Khaled bin Salman, Saudi Arabia's ambassador to Washington and the king's son, said letting women drive is a "huge step forward" and that "society is ready." "This is the right time to do the right thing," he told reporters in the U.S. Women will be allowed to obtain licences without the permission of a male relative. "I am really excited. This is a good step forward for women's rights," said Aziza Youssef, a professor at King Saud University and one of Saudi Arabia's most vocal women's rights activists. Speaking to The Associated Press from Riyadh, she said women were "happy" but also that the change was "the first step in a lot of rights we are waiting for." As recently as late 2014, two Saudi women were detained for more than two months for defying the ban on driving when one of them attempted to cross the Saudi border with a licence from neighbouring United Arab Emirates in an act of defiance. Youssef took part in numerous driving campaigns, including a widely publicized effort in 2013 when dozens of women across the kingdom uploaded videos to YouTube of themselves driving in Saudi Arabia. Some videos showed families and male drivers giving women a "thumbs-ups," suggesting many were ready for the change. For years, the kingdom has incrementally granted women more rights and visibility, including participation in the Olympic Games in London and Rio, positions on the country's top consultative council and the right to run and vote in local elections in 2015. 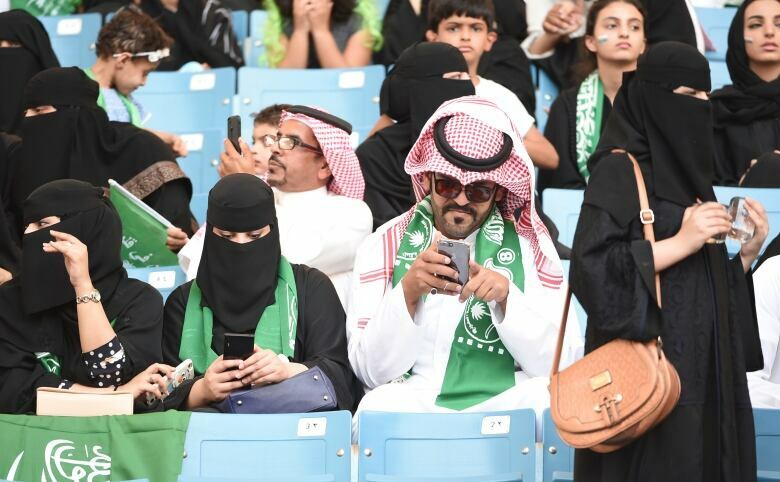 King Salman and his young son and heir, Crown Prince Mohammed bin Salman, tested the waters over the weekend by allowing women into the country's main stadium in Riyadh for annual celebrations of the nation's founding. The stadium had previously been reserved for all-male crowds to watch sporting events. The decree stated that the majority of Muslim scholars on the country's highest clerical council agreed that Islam allows women the right to drive. One Saudi cleric even stated in 2013 that driving could affect a woman's ovaries and hurt her fertility. That same year, around 150 clerics and religious scholars held a rare protest outside the Saudi king's palace against efforts by women seeking the right to drive. To celebrate Tuesday's decree, several Saudi women posted images on social media deleting their ride-sharing apps. President Donald Trump commended the order in a White House press office statement that called the change "a positive step toward promoting the rights and opportunities of women in Saudi Arabia." U.S. State Department spokesperson Heather Nauert called the move "a great step in the right direction." She did not comment on whether Saudi Arabia still needs to do more to ensure full rights for its female citizens. Antonio Guterres, the secretary general of the United Nations, also welcomed the Saudi decision, writing on Twitter that it represented "an important step in the right direction." "Today it's especially clear that this includes moves that've long been thought of by Saudis as politically risky," she said.